I&C Top 20: VML and the United Nations: "Another Silent Night"
By last December, 65.6 million people had been forced from their homes due to conflict, famine and natural disasters – an all-time high around the world. The prejudice among the refugees also rose. The United Nations and VML teamed up to raise awareness and generate empathy for the displaced people by bringing 32 of them to New York for Christmas. Using their personal stories, the refugees from 17 countries recorded a new version of a Christmas classic about peace. 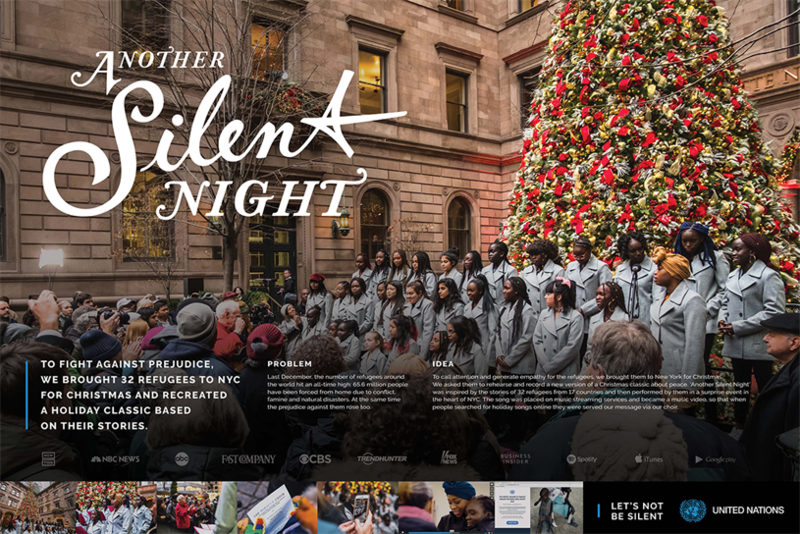 "Another Silent Night" was performed live by the group at a surprise event in New York and put on streaming platforms. The effort also drove donations to the U.N.’s Central Emergency Response Fund, which focuses on delivering funding to humanitarian crises. "The plight of the immigrant is a vital, relevant social topic. Coupling their stories with a revised Silent Night is both illuminating and emotional," said HP Marketing Chief Antonio Lucio.